article | Justice 4 Alan Blueford! Q. Who was Alan Blueford? Q. When and where was Alan Blueford killed? driveway of 9230 Birch St, Oakland, CA. Q. Who killed him, and how? striking his shoulder, one his right chest, and one close to the heart. was then shot three times while lying on his back. Q. What were Alan’s last words? Q. Did Alan have a gun? Q. Did witnesses say that Alan had a gun? phrase if Masso was sure Alan had a gun. A. We don’t know exactly why Masso shot Alan. We probably never will. attention (this is documented by the NY Police Department). What we do know is that Officer Masso served as an MP in Iraq. have been cleared up by now. ground before Masso fired, in sharp contrast to Masso’s statement. dead victim was shot, sometimes in the back, unarmed. Q. Is it true Officer Masso shot himself? Q. What did the Coroner’s report have to say about Alan? alcohol or drugs in his body. Q. Was there some issue with the Coroner’s report? report was released in mid-July. Q. When did the Blueford family first go to the City Council? A. In mid-May, a few weeks after Alan’s death. help in finding out what had happened to Alan. Q. Did they get that promised help? Q. What is the Justice 4 Alan Blueford Coalition (JAB)? to try to ensure that no further such murders are allowed to happen. Q. What has JAB done? labor unions seeking support against police violence. Q. Did JAB shut down a City Council meeting? on Alan’s death, not yet released. anyone from the City contact them. Q. The City Council met JAB’s demands? obtaining the police report is only one of JAB’s demands to the City. actions against young men of color on the streets of Oakland. Q. What has taken place since the redacted police report was released? a document titled “INVESTIGATION OF THE SHOOTING DEATH OF ALAN BLUEFORD”. Q. What were it’s conclusions? Q. Do the Bluefords and JAB accept this conclusion? tampered with — disassembled on location — was not even mentioned. for the full text of our response. all the other innocent people that have been murdered by the police? Why aren’t they being given the same attention? with the community to prevent future murders from happening. Q. What about Black-on-Black violence? Why isn’t JAB protesting that? College. Stay tuned for other events and actions. These gut-wrenching, heartfelt words were spoken at a powerful, moving public forum held here Oct. 27 on “Fight All Police Terror: Solidarity with the Victims and their Families,” sponsored by Workers World Party. The Bluefords had traveled from Oakland, Calif., to speak at forums in New York and Philadelphia on behalf of their 18-year-old beloved son, Alan Blueford, who was fatally shot on May 6 by police officer Miguel Masso. 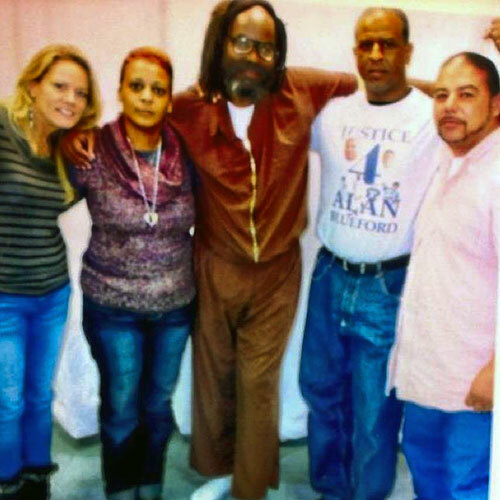 The parents are leaders of the Justice for Alan Blueford Campaign in the Bay Area. The campaign has held numerous demonstrations, including disruptions of Oakland City Council hearings. Oakland, Calif. — The Justice for Alan Blueford Coalition (J4AB) held a press conference Oct. 16 in front of Alameda County District Attorney Nancy O’Malley’s office in response to her announcement that police officer Miguel Masso would not be charged for the killing of Alan Blueford. The African-American youth was killed by Masso, a member of the Oakland Police Department, on May 6. Responding to Burris’ statement about racial profiling, Adam Blueford opened his remarks by stating, “I am the proud father of Alan Blueford.” He described how his son was just walking with his two friends, but “The DA report tries to make this out as a drug transaction.” The coroner’s report found that there was no gunpowder residue on Alan Blueford’s hands and no drugs or alcohol in his blood. To read the J4AB report and for more information, go to justice4alanblueford.org. The Blueford family and the Justice for Alan Blueford (JAB) Coalition returned to City Hall last night, after causing such a disruption at the last meeting (September 18th) that it was cancelled. On Tuesday evening, over 200 people came out to support the Bluefords in demanding answers, over 100 of whom were barred from entering the City Council meeting by Oakland police. Inside the City Council chambers, the Blueford family and several dozen supporters demanded answers and the police report, and that the officer who killed Alan be fired. This took place amidst empty seats and a large police presence inside the closed doors of the chamber, as a large crowd outside demanded to be let in. Shouts of “No Justice! No Peace!” and “Jail Masso, Now!” resounded inside and outside of the chambers, preventing City Council from conducting business for over and hour and a half. Oakland police physically barred the doors to the chamber, blocking a large group, including members of several unions and religious and community organizations from entering. The shouts of “Let us in!” and “Our City Council!” boomed, measured to be 100 decibels, as police stood smirking, guarding a half-full City Council meeting that is supposed to be a public event. After ninety minutes of constant chanting prevented the City Council from addressing their agenda, Council member Larry Reid stood up, exasperated, and gave the family his copy of the police report. At that juncture the family felt that the point had been made, again, that City Council would have to deal with this matter. The (redacted) police report, said to be available to the public soon, will nonetheless likely shed more light on the police misconduct that took place on the night of May 6th. Alan was shot by Oakland Police officer Miguel Masso on May 6, 2012. Although police contend that Alan had a weapon, several eyewitnesses all say that Alan had no weapon. The long-delayed coroner’s report showed that Alan was laying on the ground with his hands over his head when he has shot. He had no gunpowder residue on his hands despite previous allegations by the Oakland Police Department (OPD) that he had fired at Masso. Masso had shot himself in the foot, before shooting Alan three times. The Oakland police had continued to withhold the police report, and the City Council had refused to demand it (erroneously saying that they did not have that authority), until Reid handed over his own personal copy last night. The police report, a document that can typically be had in 72 hours, has been purposely delayed to hide the facts of the case. City Administrator Deanna Santana, who has had the power to both demand the police report and fire officer Masso, recently said she might give the police an additional 6-month extension, meaning it would not have been released until next Spring. It seems Larry Reid, in his frustration, deviated from the plan last night in handing over the report. City Council, instead of requesting the release of the police report (let alone demanding that Masso be fired), spent the last two weeks preparing to limit public access to City Council meetings. The family finds this unacceptable and the JAB Coalition is committed to making sure there will be no business as usual until Masso is fired and charged. The OPD, and now City Council, have lied to the Blueford family and the community every step of the way. They said he had a gun. They said he had shot Masso. They said he was taken to the hospital, when in reality he was left to die on the street, and then not taken to the coroner’s for over three hours. Chief Jordan continued to lie to the community and media, saying that Alan had fired a weapon weeks after the killing. City leaders kept saying that the police report isn’t finished, right up until the moment they gave up and handed it over. Council member Reid said they would give the Bluefords the report if they left the City Council meeting on September 18th. When the family did not fall for that tactic, which would have defused the City Hall disruption, Chief Jordan said that the police report was not ready and he needed more time to redact the document after the City Council meeting was canceled. Why has it been redacted? Why did it take 5 months and two nights of disruption to simply give the police report to Alan’s family? Why can anyone else get a report in 72 hours and a grieving family has to go through all of this? The broader questions about officer Masso bear more attention as well. Journalist Ali Winston has reported that Masso left the NYPD after his involvement in the beating of a man in custody. Why is Oakland, a city looking at the very real possibility of being the first major city in the US to be placed under federal receivership, hiring a cop who was, at that time, currently under investigation for abuse in another city? The looming threat of federal receivership, which will be decided when Thelton Henderson’s courtroom reconvenes in December, shades this whole process. The city finds itself in a catch-22. If they fire Masso they admit to police misconduct under their watch; if they persist in doing nothing (but lie and attempt to manipulate the grieving family), they will face continuous pressure and disruption from the family, the coalition and the community. Their current strategy of doing nothing to hold Masso accountable has been coupled with an attempt to limit democratic assembly in City Council meetings and smear the family’s supporters as an unruly “mob” that simply like to disrupt things. TheOakland Tribune quoted a recent report by federal monitor Robert Warshaw, which found that the investigation of questionable officer-involved shootings in Oakland had “the most deficiencies and the least inquisitiveness.” Nobody knows what changes federal receivership would bring, and by no means will it come anywhere close to resolving questions of police profiling and violence. However, what is becoming increasingly clear is that the Oakland Police and the city leaders trying to shield this cop with a legacy of brutality from justice, just might be the tipping point that ushers in that federal takeover. No one is disrupting City Council for the sake of it. There are demands. They are being made very clearly and they can be easily met. They are demands that would not even need to be made in a city that did not prioritize aiding and abetting corrupt and violent cops over the health and well-being of the city’s residents. The demands are that Masso be taken off paid leave and fired, and that he be criminally charged. The Blueford family and the JAB Coalition are not springing this on City Council, they have had 5 months to fire Masso, so that the District Attorney can evaluate the case and file charges. Maybe the police murdering young black men like Alan, who was laying defenseless on the ground without a weapon, is so commonplace to them that they feel that they can simply keep lying to the grieving family, waiting for community support to wane or criminalizing that support. Then maybe, in the worst-case scenario, the city will have to pay a settlement in a year or two, adding to the $57 million in police misconduct claims in the past ten years. City Administrator Santana has the power to fire Masso with a phone call, but does not. City officials that would help obstruct justice have absolutely no moral authority to declare those that would use their voices to demand justice an unruly mob. The significance of the City Council having their meeting behind closed doors, protected by a wall of OPD officers, just so they can carry out their business without holding that police force accountable, is only lost on the Council members themselves. The “Blue Wall of Silence” doesn’t end with beat cops and Commanders; the Chief, Mayor and City Administrator have a vested interest in making sure justice is not served in this case. Disclosing the facts of the case before the receivership ruling of U.S. District Court Judge Henderson may make the likelihood of federal receivership an inevitability, with probable political repercussions for the city politicians who have been overseeing this shameful mess. Just as Deanna Santana tried to “take white-out to her report card” with the Frazier report that detailed the dozens of OPD violations in its policing of Occupy (asking the independent investigators if she could edit the report before it was finalized), when it comes to the oversight of their notoriously dysfunctional police department, they not only keep and praise cops involved in numerous suspicious killings, they let them train other officers in how to handle weapons. When Occupy Oakland re-opened a long-closed library in the Fruitvale district, with overwhelming support and participation from the community, City Administrator Santana made evicting the library an immediate priority, and it was shuddered within days. Why after 5 months of Alan’s murder being on her radar, has Santana failed to do a single thing? When Occupy Oakland was camped out on their front lawn, City Hall lamented that Occupy had no demands and they had no one they could negotiate with, and we were met with brute force, criminalization, harassment, the suspension of 1st Amendment rights, and subjected to a constant smearing in the lapdog press that continues to this day. Here we are a year later in a much more specific struggle. You want demands? Fire Masso and charge him with murder. You want someone to negotiate with? You got it, talk to Alan’s mother, Jeralynn. To this point all she has heard from the likes of City Administrator Santana and Chief Jordan are lies, all she has gotten from the likes of City Council member Larry Reid are empty promises designed to patronize and give false hope in the city’s broken political system. A political system that, after what we saw last night, could clearly care less that their cowardly continuation of avoiding responsibility by not firing Officer Masso extends the family’s grieving and compounds their pain. This avoidance of responsibility is a perpetual pouring of salt in the wounds of the Blueford family. We are being led to believe that the real tragedy here is that City Council had their meeting delayed, limiting their time to discuss the pressing concerns of the City of Oakland, like further subsidizing golf courses to make up lost profit, or shamelessly declaring yourself an “international city of peace,” as your unaccountable police force creeps all over the city with their lights out, their twitchy trigger fingers waiting to kill another unarmed black kid without a glimmer of accountability. Time will show that the delusions of those in power in City Hall, though perhaps longstanding, played no small role in their undoing. At the end of the day, the OPD shot a young man dead in the street – an 18-year old kid, getting ready to graduate, who had no weapon, who was just waiting for a ride, who ran when a car rolled up on him with its lights out. He was later laying on the ground with his hands raised when a cop, a public employee, took his life. Masso shot him on the street like a dog, and now the City Council would rather cover it up than take responsibility and act. There is more oversight and accountability for an animal control officer if he or she were to shoot an actual dog in the street. I wish that were hyperbole, but it is a fact. If an animal control officer mistakenly shot a golden retriever belonging to a member of one of Oakland’s all-important golf courses he’d be fired, probably immediately. When the community demands that Alan’s killer be fired, City Council rescinds the 1st Amendment to make their avoidance of the issue easier. The disconnect between the people of Oakland and the city’s elected officials is clear. The OPD, City Hall and the press would rather criminalize another movement demanding equal respect for the lives of young people in the black community than take action against public employees who commit acts of criminal violence against that community. The unaccountability of the police and city officials may be par for the course for the Oakland City Council; it doesn’t mean that the Blufords and the people of Oakland need to put up with it. False sympathetic condolences and photo-opportunity crocodile tears while standing next to the family of the most recent victim one day, as you go about your business of helping to shield the perpetrator from justice the next day – enabling the same type of injustice to be carried out again in the future – may get you that all-important endorsement from the police association, but it doesn’t make you a decent human being. It certainly does not make you someone who should be vested with such authority. In May, Council member Larry Reid told the family that justice would be served or they could hold him accountable. On September 18th he tried to snooker the family into leaving the City Council chambers to pick up a redacted police report that was not even there. Since then the same Council upon which he sits has tried to pass new regulations prohibiting free speech in the chamber, in hopes that the tears and rage of the next grieving family trying to get answers to why their son was gunned down by the OPD can go unseen and unheard. Councilman Reid’s frustrated ego eventually handed over the police report he had been sitting on. It remains to be seen if he will live up to his word and see that justice is done for the Blueford family. When it comes down to it, what the Justice for Alan Blueford Coalition and the Blueford family are doing is demanding that the arrogance, apathy and hypocrisy of the OPD and city leaders no longer be tolerated or deferred to. The JAB Coalition and the Bluefords will do whatever it takes so that police profiling and murder are no longer accepted as normal, excused by those in power, and then repeated. If City Council does not like dealing with angry residents they should stop aiding and abetting those that terrorize the community. And if they want to keep excusing the same brutal tactics that put the OPD under federal oversight in the first place, they will continue to see forms of organized resistance from the community. If they are content with using draconian policies that limit free speech and assembly in order to sweep the city’s anger under the rug, saving City Council from having to hear the cries of the victim’s family, they could very well find themselves out of work after the upcoming elections – while facing something a lot harder to deal with than a couple of nights of chanting. Mike King is a PhD candidate at UC–Santa Cruz and an East Bay activist, currently writing a dissertation about counter-insurgency against Occupy Oakland. He is also a contributor to AK Press’ new book on Occupy – “We Are Many.” He can be reached at mikeking0101(at)gmail.com. Oakland, Calif. — More than 100 people rallied at City Hall on July 31 to demand justice for Alan Blueford. An 18-year-old Black youth, Blueford was killed by a police officer just days before he would have graduated from Skyline High School. Guilty only of standing on a corner while Black, Blueford was shot three times by Officer Miguel Masso of the Oakland Police Department on May 6 and left to bleed out and die on the street. The coroner’s report, released this month after mass pressure, stated that there was no gunpowder on Alan’s hands and no drugs or alcohol in his system. The July 31 rally demanded that Officer Masso be fired; that he be tried for murder for Blueford’s death; and that the Oakland City Council use their authority to push for the immediate release of the police report. In a lead-up to the rally, Tanesha Blye, Blueford’s cousin, addressed the City Council on July 26, and then served people’s subpoenas to the eight city council members and Mayor Jean Quan, demanding their attendance at the rally. None of the council members nor the mayor showed for the event, so the Justice 4 Alan Blueford Coalition posted a huge “notice of termination” announcement on the doors to City Hall. The notice included the demands stated above, a repeal of the Officers’ Bill of Rights and an end to the “stop and frisk” laws, which have become “stop and kill” laws.